Have you ever watched the videos that loop on the TV screens hanging from the ceiling, whilst waiting your turn to empty your belongings on the X-ray conveyor belt at an airport security gate – the ones that tells you what you can and cannot take with you as hand luggage? Most of us are far to busy stressing about whether we need to take our shoes off (do we have holes in our socks? ), whether to remove our belt (will our trousers fall down? ), empty our pockets and fumbling with our laptops and tablets – to even think to stop and watch. We are also usually familiar with current security rules and yet we still occasionally get caught out. A friend recently forgot she had a corkscrew in her hand luggage and had to wave goodbye to it as the security girl deftly removed it from her backpack – shame, as it was a really nice one. Others are too eager to glug down the remains of their bottled drinks before having to throw them away. 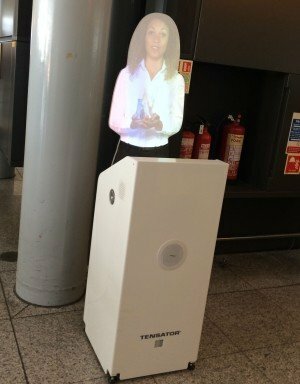 To draw people’s attention more to the security information, some airports have started showing animated videos that are projected onto a cardboard cut-out of a helpful assistant to make her appear alive. I watched one demonstrating to us earnestly at Stansted airport on my way to a conference in Ljubljana – and then watched people walking straight past her. No one stopped to watch or even glance at her. She appeared rather transparent, quiet and a bit limp and so in many ways, it was not surprising she was so ineffectual. But, when I mentioned it to one of my fellow conference goers he was convinced she had a Mona Lisa sideways look, that followed us through the aisles. That surely was enough to grab our attention. I was not convinced at all. A couple of years ago, New Zealand Airlines made a safety video that was far more attention-grabbing. Since then, they have produced a series of very funny safety videos. I got to watch one this summer when on an Air New Zealand flight to the Cook Islands. It starred Grylls (the British adventurer) in “Bear Essentials of Safety,” delivering the safety message while tracking the extinct flightless Moa bird in the South Island of New Zealand. It had me hooked the whole way through. Very witty, amusing and at the right level of info-edu-tainment. Other airlines are now getting in on the safety funny act. Virgin America, for example, just produced a very elaborate one, featuring a posse of dancers and former contestants, some from American Idol participating in a highly entertaining performance. Information salience mixed with a good dose of humour makes for compelling viewing – that stays with you. Even the jingles keep looping in your mind, admittedly, often annoyingly so. Perhaps the efforts to get passenger’s attention would be better designed with Russell Brand or Jo Brand projected onto the cardboard cut-outs, singing in cockney-style what you can or cannot take on board. But it is not just security videos that could benefit from the presenters standing out more and being funnier. Educational videos can also be made much more watchable through humour and captivating delivery. The conference I was attending on the Internet of Education was about how to enhance online and traditional education with new technologies. There were quite a few talks about MOOCs; their pros and cons, promises and reality. Some reported on how they had developed clever technologies that could help students to annotate, tag and search for video lectures and other online materials. Coursera was one of the first companies to get the ball rolling; its mission is to make high-quality education accessible to everyone by allowing the best universities to offer courses to everyone around the world, for free. Its website is mightily impressive – claiming a staggering numbers of students who have signed up for their courses and an equally vast number of courses they now offer. The fanfare and hype that greeted this free form of online learning a couple of years ago however has now been tempered by a fair share of public skepticism. It is dawning on many that it can never be the great leveler – as hoped. One of the Stanford professors, Andrew Ng, who co-founded the company, and has had a hugely successful online course in machine learning, gave the final keynote talk at our conference – virtually via Skype. He was still bubbling with boundless energy and enthusiasm. I watched him in awe – maybe the CAA could learn a few lessons from him about how to make effective safety videos. I was struck, however, as I listened to him waxing lyrical about their incredible achievements by how much of the content that gets delivered, interacted with and re-presented is all done via the computer keyboard. Inevitable, but it made me think whether we are educating a global generation of students to only talk about what they have learned through their fingers. There is no need for a MOOCs student to stand up and present their ideas, findings or concerns in a face-to-face setting or to confront their lecturers. It is largely about selecting the right answers using multiple-choice quizzes (of course there are a few courses that are the exception). Fine for working out answers and gauging the student’s progress as they work though the course, but not so good at helping them work out how to put those Q&As into practice. As any teacher or professor knows only too well, you only really learn about something when you have to talk about it yourself in front of a class of fresh-faced students. 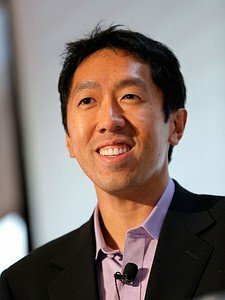 How can online education courses help students actually explain or discuss a phenomenon or theory, such as deep learning, in the convincing way that Andrew Ng does in his lectures? How can they emulate him? Not by simply watching videos, or tagging them or answering multiple-choice questions. I raised my arm and asked him what he thought about the possibility that we might be producing a generation of students who only ever express themselves through their fingers. I suggested, as well, how about getting the students to upload videos of themselves verbally explaining what they have learnt? They might then be assessed, not through clicking through a series of radio buttons, but through being matched with other students from different parts of the globe, who are also taking the same course – each critiquing the other’s presentation. Would give a new spin to the idea of study buddies. During his talk, Andrew mentioned a study that had investigated the value of having a virtual image (a bit like a cardboard cut-out) of the instructor appearing at the bottom of each slide. The researchers wanted to see what role it would play in motivating the students. To test this out, they split the class into two – and gave half the slides with the cut-out instructor appearing and the other half just the slides. Apparently, the students in the control condition were not at all happy when they found out they did not have the cut out instructor on their slides – feeling they were missing out. There was uproar and so the researchers had to abandon the experiment. That speaks volumes about the power of having the presence of a tutor near you to somehow make it feel a bit more real and that perhaps your tutor cares for you. And you never know they might just have that Mona Lisa effect.